movie summary: In the ten years since the release of Gen-Sys’ ALZ-113, the majority of the world’s population has died because of the harmful effects of this lethal drug, once considered to be the cure of Alzheimer’s disease. Deep in Muir Woods across the bay from San Francisco the great ape leader Caesar is hard at work keeping his apes at peace with each other while raising a family of two young chimps. 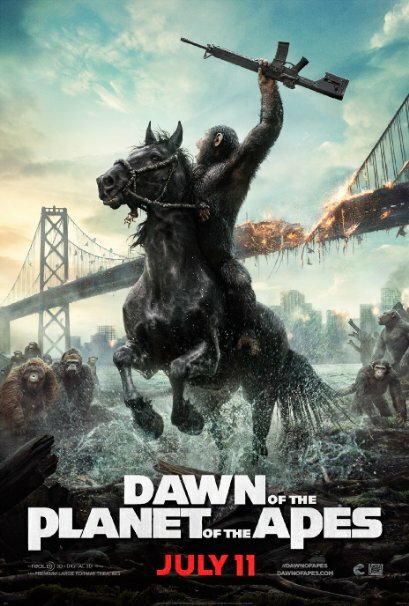 Caesar is the proud leader who united apes before the virus outbreak and led them to safety across the Golden Gate Bridge thus eliminating any further contact between apes and humans. It’s been two winter seasons since the apes last saw the bright lights of one of the west coast’s most famous cities. Maurice, Caesar’s right hand ape for advice and knowledge, thinks that all humans are gone now and it may be safe for apes to venture away from their homes to find new resources and other apes. While playing around in the woods Caesar’s son Blue Eyes and Rocket’s son Ash run into a group of humans. When Caesar and the rest of the apes learn the two boys are in trouble they ride their horses and swing from trees to surround the humans and force them away before anything bad happens. Ash is wounded when a gun misfires leading Koba to push Caesar to slaughter the humans instead of letting them walk away. Malcolm (Jason Clarke) is the leader of the human group of hikers who were looking for a dam that would help supply electricity back to the city and allow for humans to begin the process of piecing their world back together. When Malcolm reaches the city gates he meets with his leader Dreyfus (Gary Oldman) who doesn’t believe a single word of the group’s story that apes were living in the woods, that they could talk, ride horses, and carried weapons. Malcolm convinces Dreyfus and his wife Ellie (Keri Russell) that he can go back into the woods and explain their plans to Caesar, who will listen, and allow him to repair the panels at the dam to get it working again. They all think he’s crazy but he ventures off in the woods with Ellie, their son Alexander (Kodi Smit-McPhee), Carver (Kirk Acevedo), and Kemp (Enrique Murciano). When they reach the ape village Malcolm works out a deal with Caesar that they can work on the dam as long as they don’t have any guns. Things are progressing relatively quick when Koba challenges Caesar based on his loyalty of humans, Caesar puts him in his place but that only pisses him off even more. Koba decides to head into the city with two of his best friends to scout the humans and what they are up too. When the trio discover a military hangar full of guns they realize that humans are not to be trusted and they must inform Caesar to start a war and catch them off guard before it’s too late and all the apes will die. Back at the dam Caesar discovers a gun hidden away in Carver’s bag, within seconds there’s a stand-off between apes and humans with Caesar holding the only gun. He tells the humans to leave and not come back, he wants peace and that humans can’t be trusted. As night begins to fall upon ape village Caesar is standing on his legs giving a speech when he is gunned down. The apes stand motionless as they can not comprehend what they just witnessed. 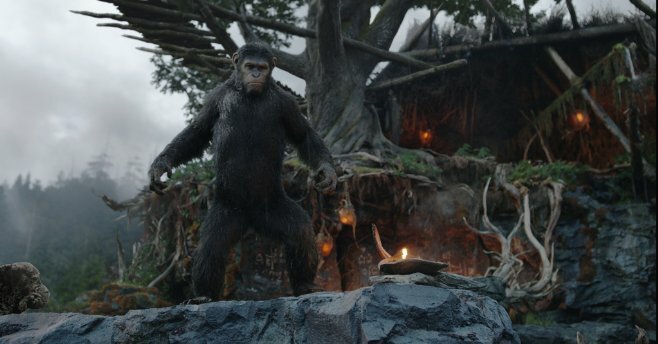 While their village begins to burn to the ground from all the chaos, Koba acts swiftly to take command and tells the apes that they must attack the humans before more apes die. He leads the charge as the apes swing into the city for an old fashion show down with Dreyfus and the humans. my thoughts: The very first thing I need to say is this movie is simply amazing. It has everything you could ask for in a summer blockbuster, there’s great acting, there’s a lot of action, gun fights, ape fights, a few funny moments, lots of drama, and heartbreak. There were actually a few moments during this movie when I was on the verge of tears based on the emotions displayed by certain characters, while other moments I found myself biting my tongue from yelling at the top of my lungs. You know you have written and directed a great movie when you can get such powerful reactions from the crowd. I am not a fan of the original Planet of the Apes movies or the 2001 Tim Burton version and will say I wasn’t fully behind this version of the franchise until last night. I said it out loud after the movie ended and a few of my friends agreed, I strongly believe that Caesar is the Optimus Prime of the Apes. He is a fearless leader that is so wise and calculating. He wants nothing more in life than to be at peace but when that doesn’t work he’s willing to sacrifice himself for the war that could stop everything. He is someone I would follow into battle because I believe in him. I didn’t fully feel this way after the first film, but his leadership, communication, and abilities were taken to a whole new level in this movie that finally made me appreciate his character more than ever. James Franco is a love it/hate it kind of guy for me even though he was a major component of the first story. It was kinda sad not to have him around for this epic journey and to have the ability to see what his best friend Caesar has turned into. Jason Clarke assumes a similar role to Franco’s as the human who means no harm to the apes and only wants to help other humans survive. His wife played by Keri Russell is a nurse who plays a major role in caring for the wounded when everything begins to fall apart, together with their son played Kodi Smit-McPhee, the trio will earn Caesar’s trust along with a few other apes and may be one of the main aids to end the major war that has broken out. On the flip side Gary Oldman is presented as an evil human ruler in the trailer when in fact he has a minor supporting role. He has a significant role in the battle sequences but ultimately he is just a stubborn fool who thinks his way is the answer to every problem. Unfortunately for him when the apes come with fire, horses, and guns, he runs because deep down he is nothing more than a coward. Kirk Acevedo’s character Carver is by far the worse humans out of the bunch and his stupidity only causes more problems than needed. He has a chip on his shoulder while having a very strong dislike for apes. The evil Koba, a close friend of Caesar’s, could only dream of a guy as dumb as Carver to come along and help fuel his plans of an all out war to end the human race once and for all. Together they two make a great pair for their blatant desire to kill one another but it’s really tough to say who deserved what they had coming to them more. There’s so much to love about this movie whether it is the ape sign language conversations, fiery ape prep talks, or ape special effects. Dawn of the Planet of the Apes has everything any movie goer could ask for in a movie in terms of bad guys, who are really ruthless and will stop at nothing until they get what they want, and the good guys who will do everything in their power to keep everyone at peace. In a world where it is survival of the fittest, egos will get in the way of some those bad people who will want to do things their way and don’t care how many lives are sacrificed as long as they reach their personal goals. All these epic moments are jammed pack with blood, sweat, and tears. You will get behind many of these characters and root for until the bitter end, while the remaining few will have you yelling at the screen to tell them exactly where to go. my final thoughts: Dawn of the Planet of the Apes is by far one of the year’s best movies and was a joy to watch on the big screen. Even if you didn’t like the original movies, or the reboots, I strongly urge you to take some time over the next few weeks to stop by your local theatre and be drawn into the amazing world that Caesar, the leader of the free apes, has created. You won’t be disappointed. Reblogged this on MooVz's Blog. I CANNOT WAIT TO SEE THIS FILM – and yes my comment is worthy of a caps lock! 🙂 Great to hear so many positive reviews about this film. Yeah, this movie was pretty damn good. A bit better than the first, if only because the story is a lot wider and more emotional now than ever before. Good review Ryan. This movie had like the perfect combination of everything to make the first one look much weaker in terms of story, character, action, drama, and emotion. Thanks for the comment Dan! Great review, loved the line about “Caesar is the Optimus Prime of the Apes”! 🙂 All the positive reviews I’ve read so far has gotten my pretty excited for this movie. Thanks for the comment, I hope you get a chance to see it this week! Caesar is just that amazing in this movie that I wanted to compare him to another hero of mine, Optimus Prime haha. Thanks for following me again. Life has been hectic lately which hasn’t allowed me to post that much but I appreciate the comment. I love this movie and consider it to be the best movie I’ve seen so far this year. Caesar was fantastic and even though I know he is a green suit come to life I honestly felt like he was real and his pain/suffering was real which led me to cry and want to get out of my seat to help him. He’s an inspiration to both apes and humans. Can’t wait for the next one! !